Netflix continues to devour all of pop culture, this time with the surprising combo of Martin Scorsese and the legendary sketch comedy show SCTV. According to a Netflix press release, Scorsese will be directing “an untitled Netflix original comedy special exploring the enduring legacy” of the Canadian show, which ran for six seasons in the ‘70s and ‘80s and launched the careers of John Candy, Catherine O’Hara, Eugene Levy, Harold Ramis, Martin Short, Andrea Martin, Joe Flaherty, Rick Moranis, Dave Thomas and more. As part of the special, there’ll be a live panel about the show at the Elgin Theatre in Toronto, featuring Scorsese, Levy, Martin, O’Hara, Flaherty, Short and Thomas, and moderated by Jimmy Kimmel. An Afternoon with SCTV will be filmed on Sunday, May 13, at 3 PM. SCTV stood for Second City Television, and was launched in 1976 with the cast of Toronto’s Second City improv theater. It ran for six seasons between ‘76 and 1984, initially on the Global Television Network in Canada, with later stints on CBC, NBC and Cinemax. Set at a struggling local TV station in the fictional town of Melonville, the show was a brilliant satire of the entertainment industry, parodying everything from blockbuster movies to talk shows, game shows and local news. Among its most famous characters were Bob and Doug McKenzie, two stereotypical Canadians who loved beer and were played by Moranis and Thomas; Ed Grimley, who, along with several of Martin Short’s other characters, was imported straight to Saturday Night Live in 1984; and Count Floyd, Flaherty’s parody of the old horror weekend hosts that could be found on UHF stations across the country. It’s seriously one of the funniest shows ever made, and, due in part to its far less strenuous production schedule, it had a hit-to-miss ratio higher than anything Saturday Night Live was ever capable of at any point in its history. If you like sketch comedy, or any of the performers listed above, and haven’t seen SCTV, you need to go track it down right now. Netflix hasn’t released much info about Scorsese’s special, other than it will exist and will reunite those comedians at the Toronto panel in May. 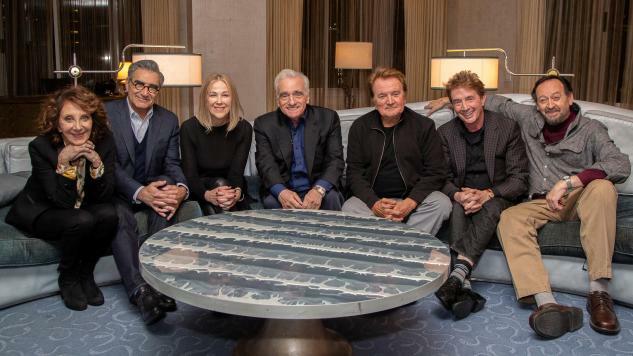 They did release a photo of Scorsese and the surviving cast (sans Moranis, who retired from acting in 1997, and poor Robin Duke, a cast member for one season who never gets any respect), which you can check out above.